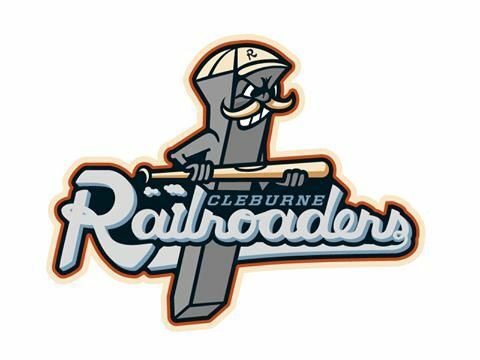 We are super excited to have former major league pitcher, Tim Crabtree, who will be joining a team from the Cleburne Railroaders for our clay shoot! Keene Police Department Detective Chip Krieger, law enforcement coordinator for the Johnson County Crime Stoppers, spoke about the program during the Cleburne Lions Club meeting. 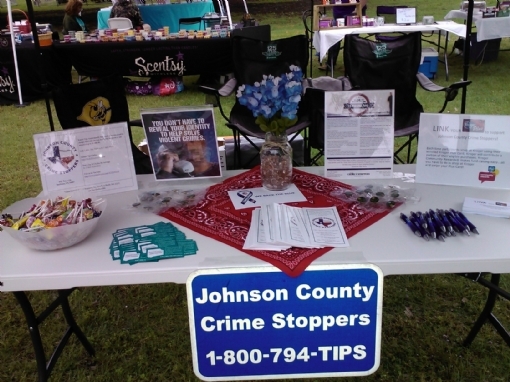 Crime Stoppers out in the community during Springfest at Hulen Park in Cleburne on Saturday, April 30th. We always need volunteers to help law enforcement with crime fighting tips! On April 30 from 10 a.m. to 2 p.m. Joshua, Burleson, Cleburne Police Departments and the Drug Enforcement Administration (DEA) will give the public its 11th opportunity in six years to prevent pill abuse and theft by ridding their homes of potentially dangerous expired, unused, and unwanted prescription drugs. Bring your pills for disposal to the sites listed below for disposal. (The DEA cannot accept liquids or needles or sharps, only pills or patches.) The service is free and anonymous, no questions asked. National Child Abuse Prevention Month is a time to acknowledge the importance of families and communities working together to prevent child abuse and neglect, and to promote the social and emotional well-being of children and families. During the month of April and throughout the year, communities are encouraged to share child abuse and neglect prevention awareness strategies and activities and promote prevention across the country. In recognition of the 40th anniversary of the Child Abuse Prevention and Treatment Act, we have designed a historical timeline of significant moments in child abuse prevention in the United States. 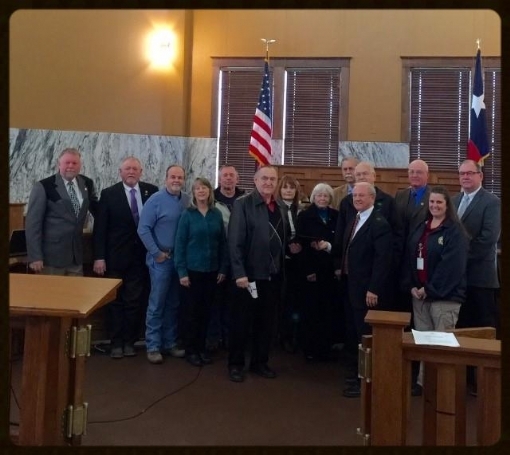 On Monday, January 11, 2016, Honorable Judge Roger Harmon of Johnson County and the Commissioners of the four precincts recognized this month as "Crime Stoppers Month". 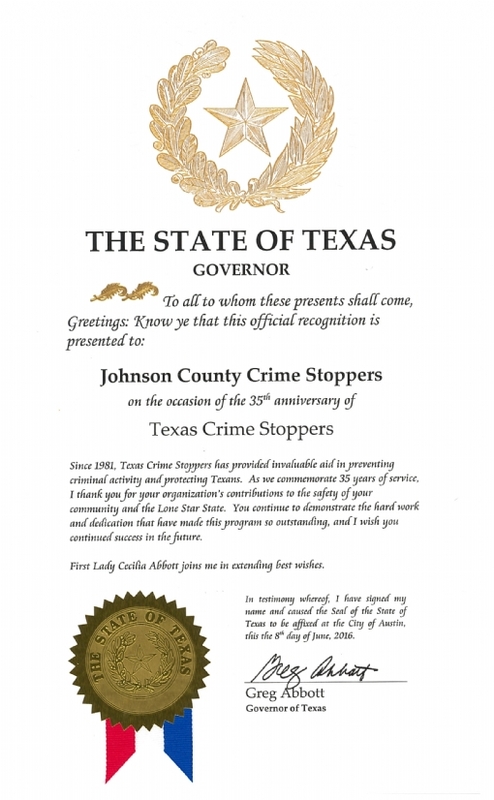 Volunteers and board members of Crime Stoppers were in attendance to receive the proclamation. 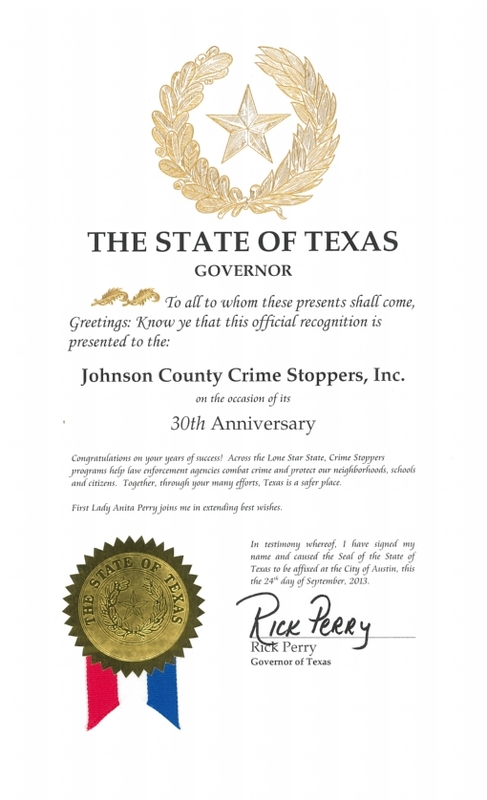 In 2015, Johnson County Crime Stoppers received 158 anonymous tips. A total of 6 adult fugitives were captured and $100,524 worth of drugs confiscated. Fourteen tips were received reporting drugs or weapons on middle or high school campuses in Johnson County. The anonymous tipsters received payout rewards totaling $4,450. On Tuesday, October 27th @ 6:30 p.m., Cleburne PD will host a meeting on what to look for and how to proactively help prevent or deter potentially harmful activity online. The goal is to educate parents about what lurks on the Internet. This meeting is for PARENTS AND ADULTS ONLY. Please share this information with anyone you think may be interested. Click on the flyer link below for additional details. If you’re interested in raising awareness, there are several ways to get involved. 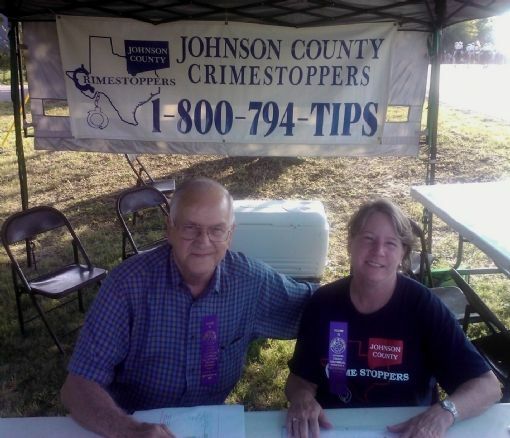 Members from Crime Stoppers assist at the registration of parade entries during the Johnson County Pioneers and Old Settlers Reunion in Alvarado. At first glance, it might appear that this behavior is easy to define. A common image of bullying might be of a physically intimidating boy beating up a smaller classmate or of one child shoving another inside a hallway locker. While that is still considered bullying, it's important to know that bullying behaviors can be much more complex and varied than historical stereotypes. The effects of bullying can be short-term and/or long-term and can include; decreases in grades, loss of concentration, depression and anxiety, post-traumatic stress, low self-esteem and physical ailments. Bullying behavior can be physical an ddirect, or can be emotional and social. Social media has opened up a new platform for bullying behavior and online bullying is harder to escape. Step in and stand up, The Bullying Prevention Center says that nearly 60% of bullying situations end when a peer intervenes. Educate yourself and others on prevention behavior. Be supportive, listen and let the victims know you care. OPEN THE DIALOGUE! Ask others to stand against bullying. This information and more can be found on the National Bullying Prevention Center website. The state of Texas is #3 of the top 10 states with the most stolen vehicles. Never leave valuables in your vehicle, especially in plain sight. Park in well-lit areas- in a garage, if possible. Crime Stoppers Legislative Day was a huge success thanks to the many dedicated volunteers from 16 different programs who participated, including volunteers from Johnson County Crime Stoppers. 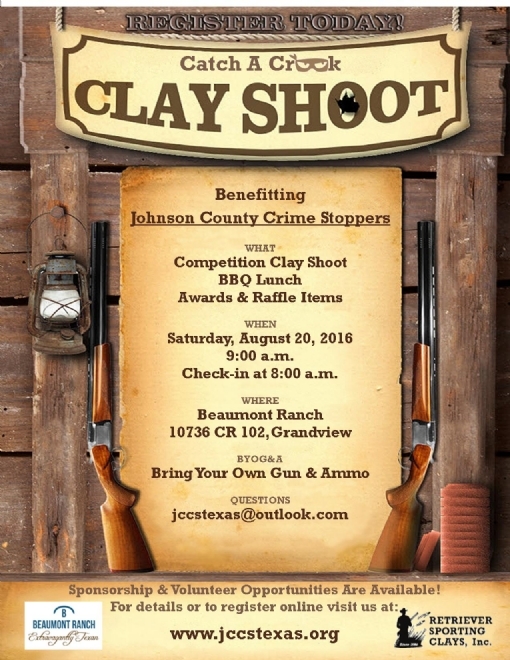 Representative Joe Pickett of El Paso, a former board member of the El Paso Crime Stoppers, and Senator Joan Huffman of Houston, Vice Chair of the Senate Committee on Criminal Justice, each sponsored a resolution on behalf of Crime Stoppers. Attendees heard from various speakers, including Representative Pickett, and visited their legislator offices to spread awareness of the impact Crime Stoppers has on local communities. 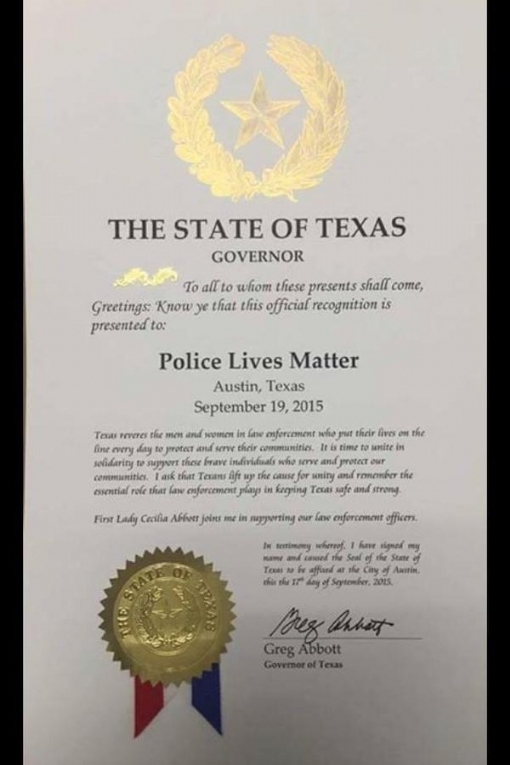 See the House Resolution here and the Senate Resolution here. 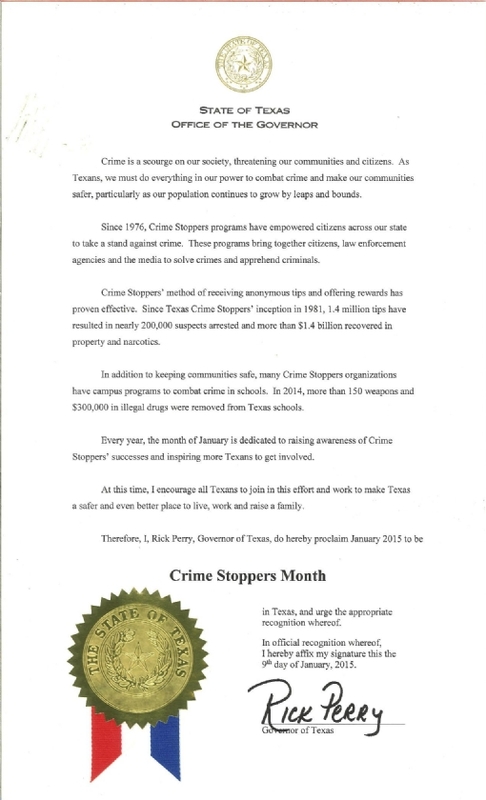 AUSTIN, Texas — In what will be one of the governor's final proclamations in office, Texas Governor Rick Perry issued a proclamation today, January 12, 2015, declaring the month of January as “Crime Stoppers Month” in the state of Texas.